Research on gray water use for home irrigation has been getting positive initial results. Inside a greenhouse on the grounds of the Texas A&M AgriLife Research and Extension Service Center in Uvalde, Dr. Raul Cabrera recently inspected several groups of ornamental plants for signs of damage or distress. 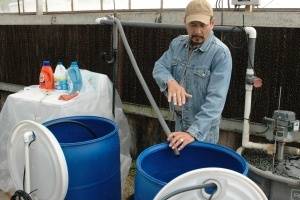 “This is the first component of our practical gray-water investigation,” explained Cabrera, who along with colleagues from the Uvalde center and the Texas Center for Applied Technology started research in late 2012 to confirm the potential use of gray water for home landscape irrigation. Gray water, explained Cabrera, is basically the soapy water that remains after tap water has been run through a washing machine or used in a bathtub, bathroom sink, or shower and does not contain serious contaminants. To perform his research, Cabrera set up sections within the greenhouse where he placed multiple pots or containers of about a dozen different ornamental plants – ranging from herbaceous and flowering plants such as Mexican heather, Asiatic jasmine, lantana and dianthus, to hardy native and adaptive ornamentals such as yucca, agave, oleander, and yaupon holly. The plants are irrigated through a network of PVC and plastic tubing from 55-gallon plastic containers that water different sets of each plant species with tap water and three varying degrees of gray water. Cabrera chose what he considered the most popular domestic brands of detergent, fabric softener, and bleach for his experiment, using each according to its manufacturer’s recommendations. After two and a half months of irrigating these various ornamentals with different types of gray water, Cabrera said initial results based on visual inspection of the plants are promising, with a few exceptions. However, Cabrera added, the gray water containing bleach had little effect on the remainder of the ornamentals used in the experiment, particularly the hardier plants like holly, yucca, and agave. Cabrera said this research is particularly relevant for drought-prone Texas as it may reduce household landscape water use by as much as 10-25 percent or more, depending on the size, geographical location, and plant selection. He noted that the average household currently uses about 50 percent of its water consumption for landscaping – irrigating turf grass, ornamentals, and trees. He added that implementing the use of gray water for landscape irrigation across the state could mean a tremendous water savings in terms of acre-feet of water, contributing to the statewide water use and conservation goals of the 2012 Water Plan. Cabrera said he will continue this first phase of irrigation trials in the greenhouse for another two months as preparations are made for the second component of gray water experimentation. Cabrera said this is the kind of information needed by city planners, water-system administrators, and municipal, county, and state officials for the purpose of officially permitting and promoting the use of gray water as a significant urban water conservation practice. “We hope this also will lead to support by other agencies, groups, and organizations and eventually expand into a statewide initiative to inspire people to use gray water for home landscape irrigation,” he said.